Heat oven to 375°F. Arrange frozen biscuits and asparagus on ungreased cookie sheet. Drizzle oil over asparagus. Bake at 375°F. for 20 to 24 minutes or until biscuits are deep golden brown and asparagus is crisp-tender. During last 10 minutes of baking, microwave butter in small microwave-safe bowl on High for 20 to 30 seconds or until melted and hot. Stir in mayonnaise, milk, lemon juice and dill weed. Spoon salmon into another small microwave-safe bowl; cover. Microwave on High for 30 to 45 seconds or until warm. Split warm biscuits; place halves, cut side up, on individual plates. Top each with tomato slice and hot asparagus. 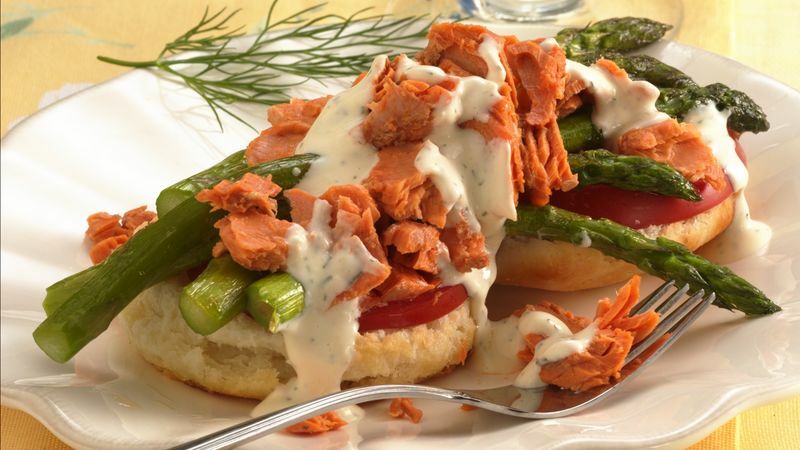 Arrange warm salmon on top of asparagus. Drizzle with mayonnaise mixture.